Ben is a content associate at Bullhorn working on the Recruitment Innovation Exchange. 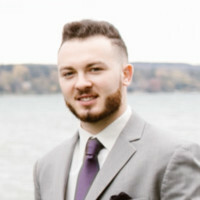 During his young professional career, Ben self-founded InVision Media, a small business supporting companies and organizations interested in promoting their message and value proposition via marketing through social media and video editing. Before joining Bullhorn in 2018, Ben was the captain, president, and social media manager of the University of Maryland Men’s Ice Hockey team. Follow Ben on Twitter: @bennybyline. There is no denying the past few years have been a politically and culturally turbulent time in the United States. 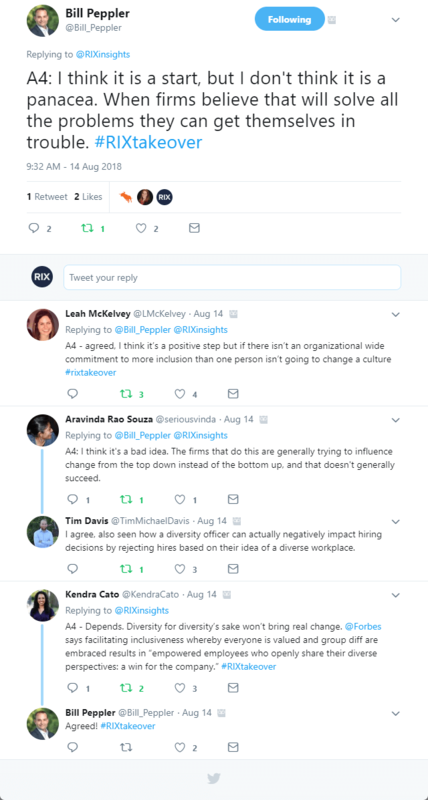 With powerful movements like #MeToo, #TimesUp, #OscarsSoWhite, and #NeverAgain permeating our society, it’s become quite evident the topic of diversity and inclusion is at the forefront of corporate conversation. Further complicating matters, what seem like instantaneous decisions are truly deeply ingrained unconscious behaviors. Our minds are constantly cross-referencing every person, action, and situation we see against our background, cultural environment, and personal experiences. In milliseconds, our brain has decided how we feel about something, while regularly omitting the clarity of why we feel that way. 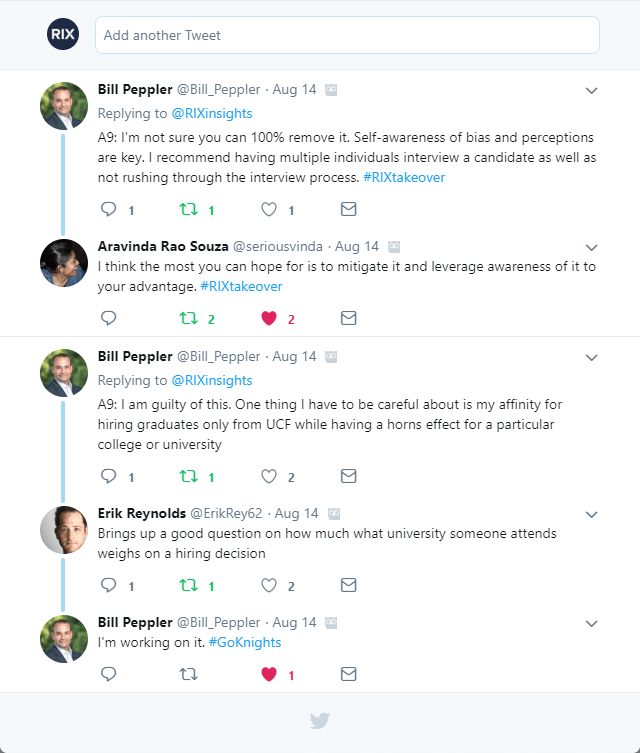 On Tuesday, August 14th, we dug deeper into the inner-workings of our minds with a thought-provoking conversation on Twitter on the impact of unconscious bias with Bill Peppler, COO at Kavaliro. Now, while the chat may have already concluded, this does not mean you can’t still share your thoughts. 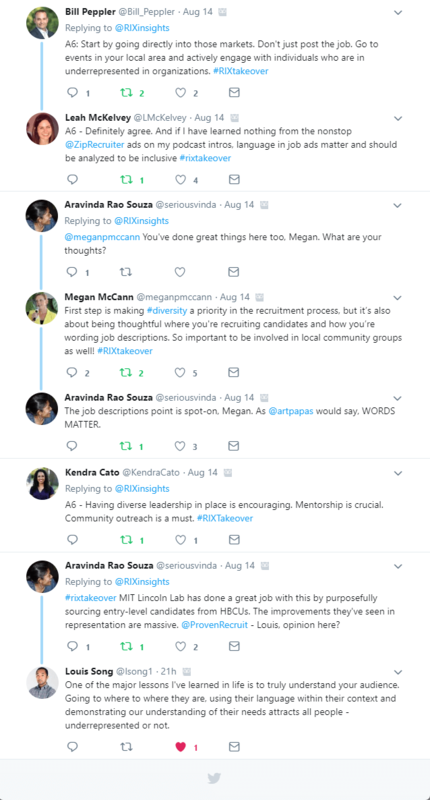 We would love to continue to build the conversation, so feel free to reply to any of the questions or answers (every Tweet and image is clickable) at @RIXinsights using the hashtag #RIXtakeover to share your input on the impact of unconscious bias. 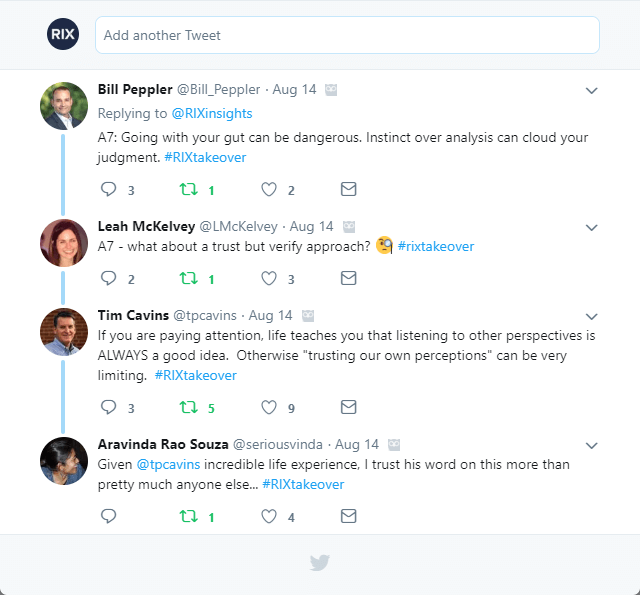 Here’s how RIX’s fearless leader and the rest of the Twitter community responded. 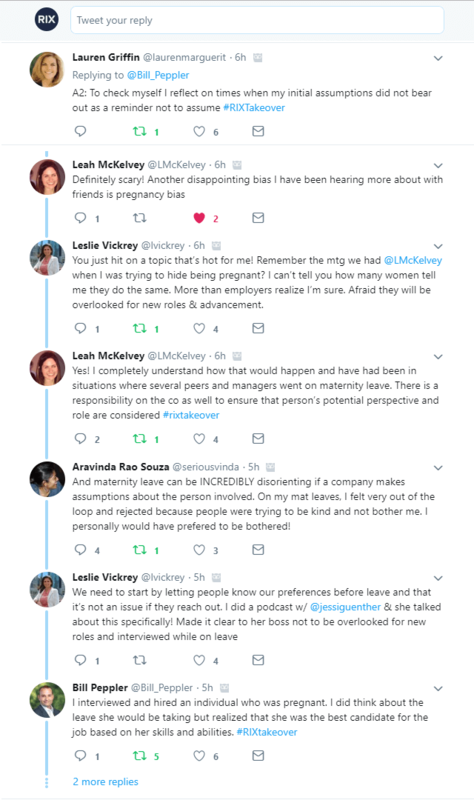 This question stirred up some fantastic responses from a handful of strong female leaders in the staffing industry, including Senior Vice President at Adecco, Lauren Griffin. 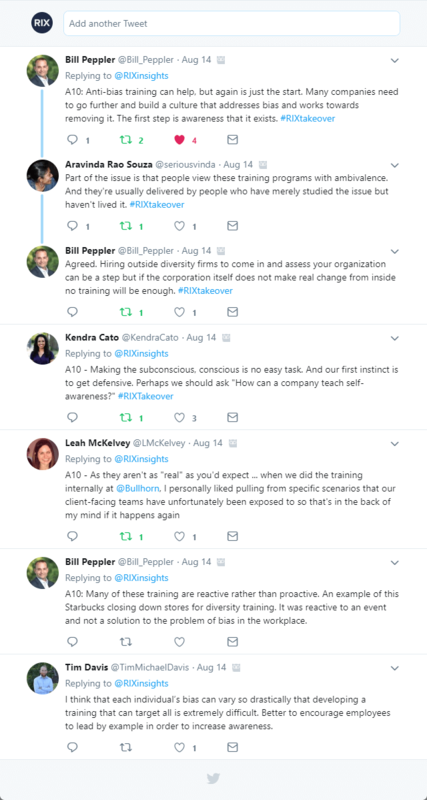 In Q3, we discussed success stories of a time you have helped combat unconscious bias, and we learned that sometimes we form judgments from preconceived societal biases! @Bill_Peppler @RIXinsights Agreed – also, not assuming that men can't understand something. I used to go into meetings with all men thinking that they would shut me out of the conversation. In reality, they were in many cases welcoming. The bias was on me – not on them. Q4 raised the discussion of the usefulness of Chief Diversity Officers. According to The Fintech Report, over 20 percent of Fortune 500 companies now have a Chief Diversity Officer, but how effective are they really? 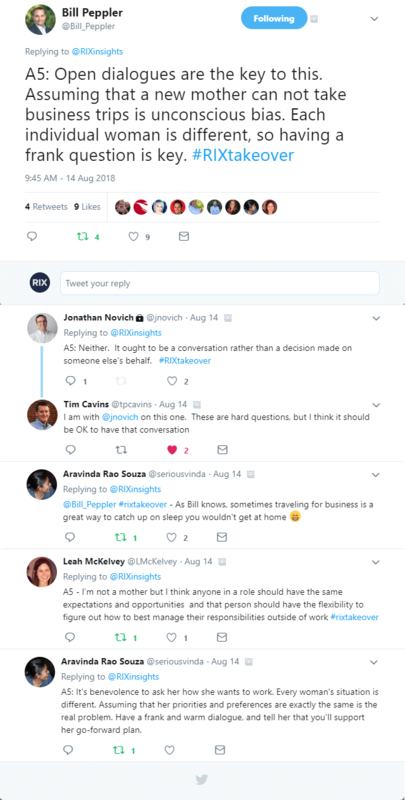 Q5 readdressed a topic many felt passionate about from the A2 answers, asking how you should approach handling a new mother returning to work. Here are some of the best responses from this question. 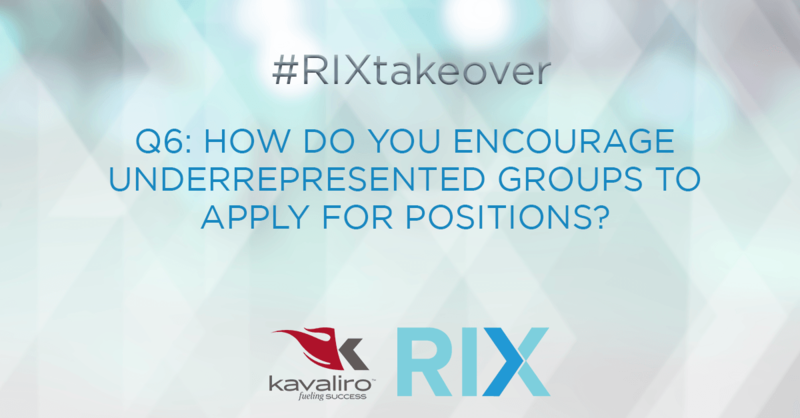 In Q6, we asked how you encourage underrepresented groups to apply for positions. Q7 was quite the loaded question. Can we trust our own perceptions? 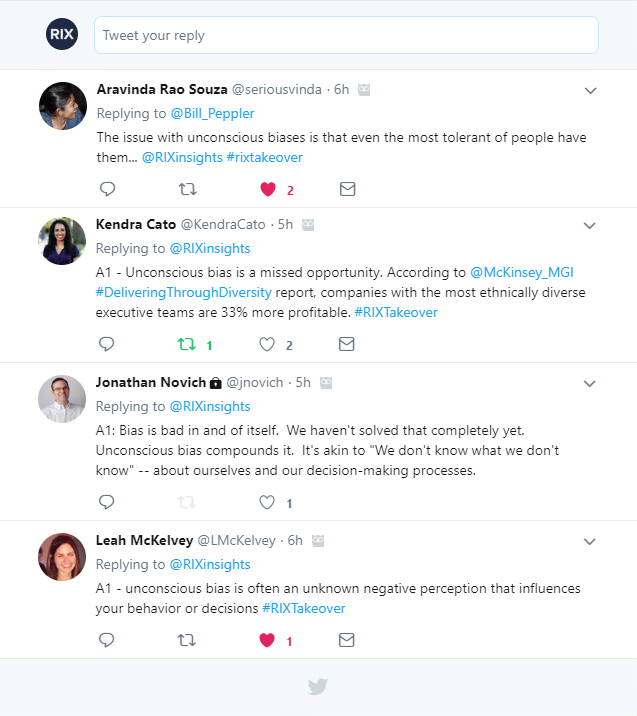 Q8 posed the question, is unconscious bias inherently bad? Everyone has their own unique biases, their unintended people preferences, whether we choose to be aware of them or not. There is no antidote for our unconscious biases, but with a little personal self-reflection and awareness of our surroundings, we can certainly take a stab at addressing our judgments before they become liabilities. 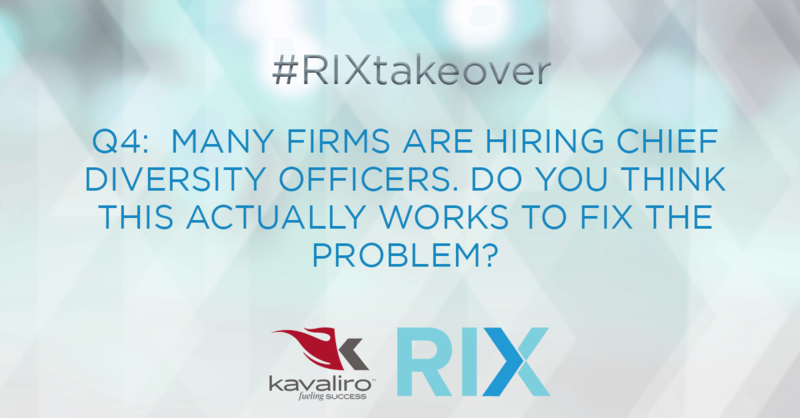 Thank you again to Bill Peppler, Kavaliro, and everyone who participated in making our first #RIXtakeover a huge success. We are already looking forward to the next #RIXtakeover opportunity!